I have more than 250 plants in containers of different sizes in my kitchen garden. 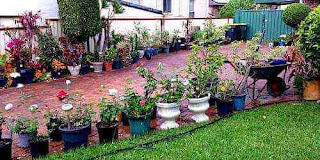 I grow vegetables, herbs, spices, flowers and fruit trees in pots of sizes ranging from small to large. The health and growth of the plants depend on how much, how often and how I water the plants, besides other things. The question is how to water plants in containers? My many of the friends often complain that their potted plants suffer due to under-watering. That is true, but over-watering can kill the plants. During the early years of my gardening, I killed some of my lovely plants by giving them too much water. What are the signs of plants that are water stressed or over-watered? How do you know about the watering needs of a plant, how much water does a plant need a day and when? The real question is how should water your plants in pots outdoors or indoors? Hot summers and dry wind can quickly dry up your plants. The situation becomes worse if you have Terra cotta, plastic or metal containers, the temperature of the soil inside may reach up to 80 deg C.
Sometimes, the water makes a short passage in the pot's soil. If this happens, then the water will just come out of the holes as soon as you water the plant. You should mix some compost in the soil to make it water retaining. Detailed guide is given below on how and when to water outdoors and indoor potted plants and how much water your plants need in pots. Giving below are tips for watering plants in containers. Sometimes, if very hot temperatures or hot winds are expected, then you may need to move your plants in the shade. Apply a thick layer of mulch on the top of the soil of the plant. This will help retain moisture and prevent weeds. Always water on the soil and not on the leaves. Wet leaves promote fungus and other diseases. The droplets on the leaves act as tiny lenses which focus sun on them, which may cause sunburns. Always water in the morning so that any wet leaves get dry up during the day. Otherwise leaving wet leaves overnight may cause many plant diseases. If you cannot water in the morning, you can water them in the evening but be careful and avoid watering the leaves. The question is what is the right amount of water for a potted plant. Too less and too often watering is not good for the potted plants. You should give a good drink, all over the span of the pot until the water starts to emerge from the bottom of the container. This will ensure that even the deeper roots get enough water. If water does not reach to the bottom of the pot, then the roots remain on the top portion of the container, which is not good for the plant's healthy growth. Keep in mind that all plants are not the same, different plants have different moisture needs. Most plant do not like soggy and damp soil all the time, but just damp. The need for outdoor and indoor potted plants are different. Vegetable like cucumbers (growing cucumbers from seeds), tomatoes (grow tomatoes in pots), gourds, pumpkins, etc. need lots of water. Succulents and cacti (how to water succulents) require very less water and thrive on dry soil. Annual flowering plants should not dry up. Fruit plants need to be kept damp while flowering and fruiting, otherwise they will drop all the buds. Some herbs like basil, coriander/cilantro, dill, rosemary, thyme, oregano prefer a little dryness between waterings. If the leaves of the plants are drying up, it is the sign of less water in the plant. If the leaves become soggy, it is the sign of too much water. During hot summers, you may need to water the plants both in the morning and evening. Insert your finger about a inch deep in the soil. If your fingertip feels dry, you should water the plant. If the plant is completely dried up, then you can submerge the whole pot in water until it has stopped bubbling. You can also make deep holes in the soil with a stick, and then water it. If the pot is vigorously growing and has developed very dense root system over the years, then the roots will start to emerge out from the drainage holes at the bottom. A very dense root system will restrict the water absorbance and the bottom roots will be becoming completely dry. This is the time when the plant needs to be transferred to the next higher size. Don't Rely on the Rain - Even if it has rained, check the soil and water if necessary.